2007 was the very beginning of the mobietec story. Initially started as a one man business, the company quickly became a blooming firm, who employs currently more than 20 people. 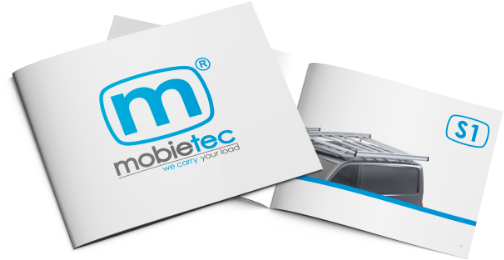 mobietec is a leading Belgian manufacturer of high-quality aluminum accessories for commercial vehicles. With more than 10 years of experience in both production of roof racks, glass carriers and ladders and in provision of solutions made to measure, mobietec can respond precisely to the needs of every customer. By choosing anodized aluminum, the mobietec range is distinguished by its low weight, very high loading capacity and beautiful appeal and image. The recyclable nature of aluminum, the proximity of suppliers and the lightweight profiles also ensure that production can be done with respect for the environment. Thanks to the modular structure and the intelligent profiles, supplying customization is a specialty. Through an extensive network of garages, installers/converters and distributors, products are not only available in Belgium, but also in large parts of Europe. In order to offer the best possible service to our customers, mobietec also has its own service/assembly team on the road across Belgium. All products are designed in our own R & D department. mobietec always works with aluminum in combination with stainless steel. The knowledge of these materials, helps us to constantly design new products or to improve existing products, in order to increase their user friendliness. Because we execute this process in-house, we can launch new products relatively short-term. After development and the making of a prototype, the product is tested. Theoretical tests are done by specialized computer programs and use tests are carried out in our workshop or outdoors. If certification is required, we work together with a recognized external partner. After designing the manuals for the workshop, preparation for serial production can begin. The entire production process is subject to various checks, before the product departs to the customer. Assembly instructions are provided if the product is installed by the customer himself. Each product has its own user guide, which is destined for the end user. This guidebook contains the necessary information, to register the product on this site, so warranty can be validated. By means of the serial number of your product, you can be helped quickly in case of breakdown or problems. A service demand can be made by email or telephone.